In a large mixing bowl, whisk together 2 cups flour and salt. Cut butter into flour mixture with a pastry cutter or fork until mixture resembles coarse crumbs. Add buttermilk and egg yolk to mixture and stir until mixture comes together and you are able to form a ball. Cover bowl with plastic wrap and refrigerate dough while preparing apple filling. Peel, core and dice apples into thin and small pieces. Place diced apples in a large mixing bowl. Add orange juice and 1 tsp vanilla and toss apples to evenly coat. In a separate mixing bowl, whisk together 1/2 cup flour, granulated sugar, light-brown sugar, 1 1/4 tsp cinnamon and nutmeg. Pour flour mixture over apple mixture and toss to evenly coat, set aside. Divide pie dough into 2 equal portions. Roll one portion into a 13x9 inch rectangle on a lightly floured surface. Lift rolled dough into an ungreased 13x9 inch baking dish (the easiest way to do this is to fold the dough in half and then fold in half again, then transfer folded dough to one corner of the dish and unfold to it's original shape to cover entire baking dish). Toss apple mixture once more and pour into baking dish over pie crust. Roll remaining dough into a 13 1/2 x 9 1/2 inch rectangle and place rolled dough over apples (folding and unfolding as previously noted). In a small mixing bowl whisk egg white until foamy, brush egg white over top pie crust (you will only need about half of the egg white). In a separate small mixing bowl whisk together 1 1/2 tbsp Raw Turbinado sugar with 1/4 tsp cinnamon. Sprinkle cinnamon sugar mixture evenly over top pie crust. 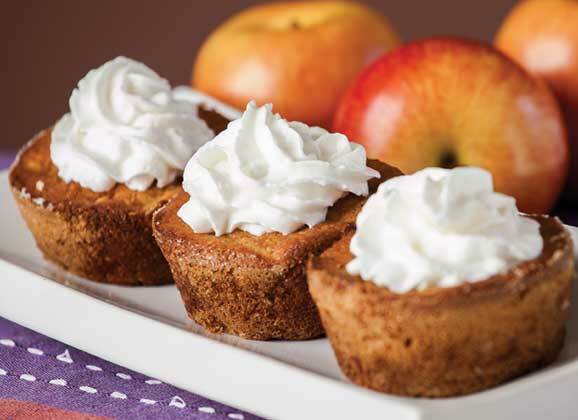 Bake in preheated oven 50 - 60 minutes until golden brown and apples are tender when pierced with a toothpick. Remove from oven and allow to cool at least 30 minutes before cutting into squares. Store bars in refrigerator in an airtight container, rewarm in microwave if desired. _Optional Vanilla Glaze: Combine all glaze ingredients in a small mixing bowl, whisk until smooth. Add an additional 1/2 Tbsp half and half if you'd prefer a thinner consistency. Drizzle with optional glaze or serve with vanilla ice cream. thanks for the recipe. I’m about to try it and realized you didn’t include oven temperature. so good thing you included the referral to original recipe at cooking classy because they listed at 350 degrees…and now I can make the recipe. Thanks! Thanks for catching that Michelle! We will change it in our recipe post as well. Let us know how the bars turned out!